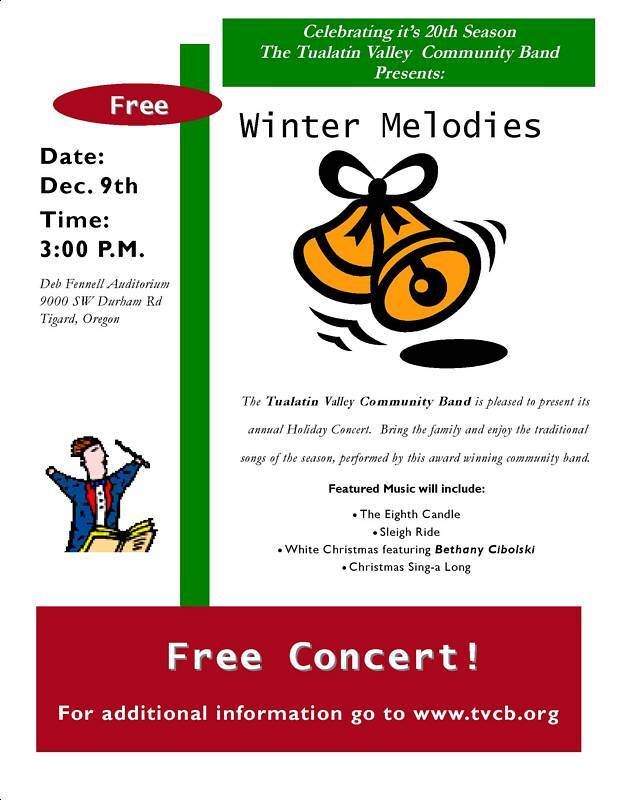 The Tualatin Valley Community Band (TVCB), under direction of Steve Heuser, will present a free "Holiday Concert" at 3 pm Sunday, December 9th in the Deb Fennell Auditorium, Tigard High School, 9000 SW Durham Rd, Tigard, OR. Programmed selections include - "A Festive Christmas," by Kenny Bierscheck, "The Eighth Candle," by Steve Reisteter, "A Vaughan Williams Christmas," by Ralph Vaughan Williams, "Santa Meets Sousa," arr. Mark Williams, "Yuletide Celebration," Douglas Court, "Sleigh Ride," Leroy Anderson, "White Christmas," Irving Berlin, "Merry Christmas, Everyone - Sing Along," Steven Reineke, and "Finale for a Winter Festival," James Curnow. Lyric soprano Bethany Cibolski will be our featured soloist in a concert containing many traditional or newly arranged holiday favorites. Bring a friend, relax, and sing along with Bethany as we get into the holiday spirit. Visit http://bethanycibolski.com/default.aspx for more information about our guest soloist. * "Miles for Smiles" Pictures Posted - The Rain Stayed up in the Clouds and TVCB Played for the Crowd!!! * "Spring Into Music" Evening Concert - Friday, May 11, 2007, 7:30 pm Pictures Posted!!! 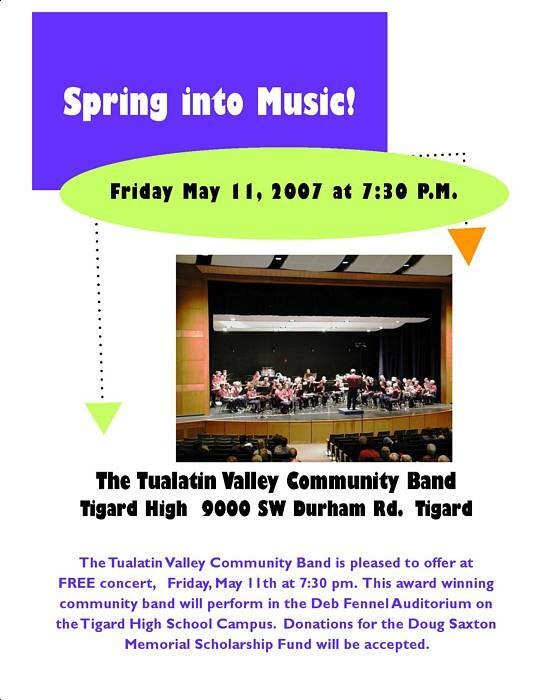 The Tualatin Valley Community Band, under direction of Steve Heuser, will present a free Spring Concert on Friday, May 11th at 7:30 pm in the Deb Fennell Auditorium, Tigard High School, 9000 SW Durham Rd Tigard, Oregon. The concert will feature a mixture of traditional and new melodies that will have you humming through the weekend! * Adult Band Festival - April 28, 2007, 11:15 am Pictures Posted! TVCB thanks the Lake Oswego Millennium Band for hosting the Oregon Adult Band Festval. TVCB had a great time! "First Suite in E Flat for Military Band," by Gustav Holst. Lynette Wyrick and Steve Heuser invite you to join them in an evening of traditional Christmas caroling on the Lake of the Commons in Tualatin. The Tualatin Valley Community Band will provide musical accompaniment, while local sponsors will provide cookies, cocoa, cider and coffee. Local merchants are providing this free event to say "thank you" to the citizens of Tualatin for supporting their businesses this past year. After choruses of Jingle Bells, Away in the Manger and other seasonal favorites, the evening will be concluded with the singing of Silent Night and floating of candles on the lake. Come sing and celebrate the joy of the season and the wonderful community we live in with family, friends and neighbors. For more information, please contact Lynette Wyrick or Steve Heuser at 503-691-9700. Member call time is 4:30 pm. * Holiday Concert "Winter Melodies," December 10, 2006 - 3 pm - Pictures Posted! The Tualatin Valley Community Band, under direction of Steve Heuser, will present a free Holiday Concert on Sunday, December 10th at 3 pm in the Deb Fennell Auditorium, Tigard High School, 9000 SW Durham Rd Tigard, Oregon. The concert will feature a number of traditional and newly arranged holiday melodies, plus a few new tunes that will have you humming through the holidays! A special “thank-you” to the Washington County Arts, Heritage & Humanities Coalition for sponsoring this concert! 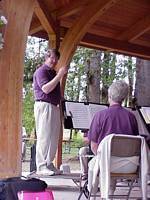 A loyal group of over 100 attended a very warm but windy concert in a shady Cook Park at the Bishop-Scheckla Gazebo on Sunday. We appreciate their support. and look forward to seeing you at our next concert. * July 4th Tigard Fireworks pictures are posted! 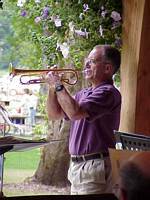 The Tualatin Valley Community Band, under direction of Steve Heuser, presented a free "Spring Concert" on Sunday, May 21st, 3 pm at the Tigard Library, 13500 SW Hall Blvd, Tigard, OR. This hour long concert, with special features of the flute section and a trio of trumpets, was a bit hit with the audience. We'll be seeing you at the July 4th Fireworks at Tigard High Stadium. 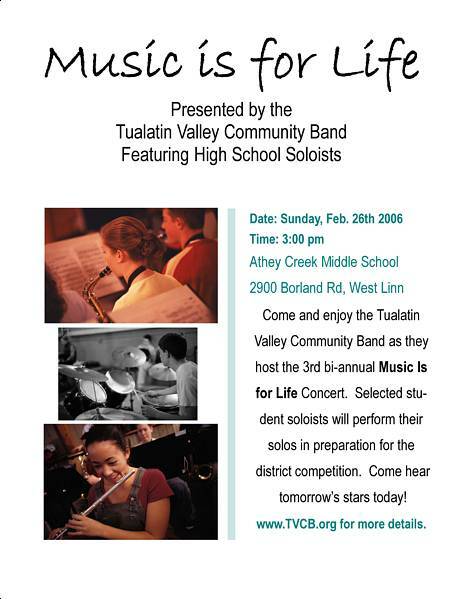 The Tualatin Valley Community Band, under direction of Steve Heuser, will present a "Music is for Life" concert featuring high school soloists preparing for district solo and ensemble competition. The concert is free and scheduled for Sunday, February 26th, 3 pm at the Athey Middle School, 2900 SW Borland Rd., West Linn, Oregon. Please join us for the excitement of live music and an opportunity to listen to students perform! Donations gladly accepted at the door. * Sunday, December 11, 2005, 3 p.m. Pictures posted!!!! The Tualatin Valley Community Band, under direction of Steve Heuser, will present two free holiday concerts this December. The first concert is Sunday, December 11 at 3 p.m. in a new venue, the Tigard Public Library Community Meeting Room. Please join us for the excitement of live music and an opportunity to sing with TVCB! Overflow parking is available at Tigard City Hall. * July 31st Cook Park Pictures Posted. Just click here. See you at Tigard Library on September 14th! TVCB thanks all who attended our concert on July 31st. It was the largest summer concert attendance yet! Please attend our fall and winter concert series. Details will be posted on this webpage and through our e-mail list server. * 4th of July Pictures Posted. Click here! * Tigard Volunteer Recognition Concert pictures posted! Just click here! Approximately 260 music patrons attended our concert! Thank you all for your interest and contributions to live music! Caroling on the Commons Pictures Posted! Holiday Concert, December 12, 2004, 3 pm, Concert pictures posted! Concert selections included - Semper Fidelis, John Philip Sousa; Legends and Heros, Pierre La Plante; Egmont, Ludwig Van Beethoven; Florentiner March, Julius Fucik; Defying Gravity, Steven Reineke; Alleluia! Laudamus Te, Alfred Reed; Variations on "Deck the Halls," Robert Smith; Santa Meets Sousa, Mark Williams; A Festive Christmas, Kenny Bierschenk; Christmas Day, Gustav Holst; Christmas "Pop" Sing-A-Long, arr. James Ployhar; Sleigh Ride, Leroy Anderson. Many thanks to all who attended our concert. We appreciate your support and hope you can attend one of our concert this coming year. Our schedule will be posted to our webpage in early September. Concert Program: Strike Up The Band, George Gershwin; The Good Old USA, James Christensen; The Silver Gazebo, James Barnes; The Cowboys, John Williams; Swing Low, Sweet Chariot, Steve Rouse; Pirates of the Caribbean, Klaus Badelt, Arranged by John Wasson; Night In Mexico, Paul Creston; Looney Tunes, Arranged by Bill Holcombe; Gaelic Rhapsody, Elliot Del Borgo. Please join the Tualatin Valley Community Band for a 4th of July concert in the stadium before the big fireworks show. We'll play several marches and patriotic compositions. It will be a beautiful night under the stars! JUST A REMINDER - OUR NEXT CONCERT IS JULY 25TH IN COOK PARK! TVCB was honored to perform with 13 other bands in the Dallas High School Auditorium on Saturday. TVCB performed the following works: Prairiesong, Carl Strommen; Allerseelen, Richard Strauss, directed by Robert Shannon; Sun Dance, Frank Ticheli; Humoresque on Swanee, John Philip Sousa; Lassus Trombone, Henry Fillmore, Arr. Loras Schissel. Congratulations to Steve Heuser, Director, Robert Shannon, Associate Director, our outstanding soloists, and TVCB members for a great performance! The concert will consist of seasonal tunes and holiday favorites that the entire family will recognize and enjoy. Color Guard provided by the Marine Corps, Beaverton, Oregon. St. Anthony's 125th Anniversary Pictures are posted! It was a real honor to play for this festive event. We wish them well in their next 125 years! A 50th Anniversary Commemoration: The End of the Korean War Pictures Posted! The City of Tigard, American Legion Post 158 and the Tualatin Valley Community Band will honor all Veterans, but especially Korean War Veterans at a free Songs of Summer concert. Bring your lawn chairs and enjoy a relaxing afternoon of live music. Need a reminder? Just click here for four tickets! Concert and Fireworks Pictures Posted! July 4, 2003, Tigard High School Stadium. Many thanks to all who attended this fun event and to the Tigard 4th of July Committee. June 1,2003, Evergreen Aviation Museum Pictures are Posted! TVCB played a full concert of patriotic and classical music at this historic location, home of the Spruce Goose and the newly arrived SR-71 Blackbird. The traveling Viet Nam Memorial Wall was an honored exhibit at the Air Museum. May 20, 2003 Pacific Point Retirement Inn Click here for pictures! 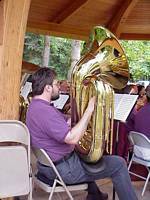 On May 1, 2003, the Tualatin Valley Community Band Board of Directors selected Justin Bowman as the winner of the 2003 Doug Saxton Memorial Scholarship. Concert on Sunday, May 4, 2003! Click here for pictures! 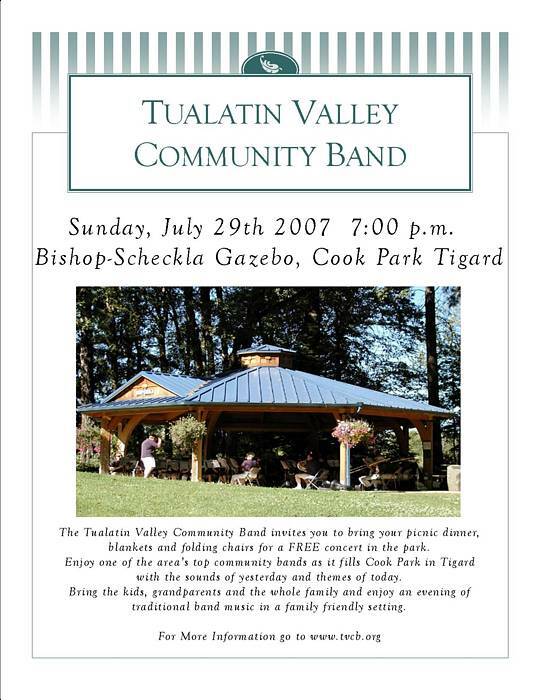 The Tualatin Valley Community Band will played a free concert consisting of a wide variety of classical and popular music on Sunday, May 4, 2003. A special "thank you" to the Tigard Optimists Club for ushering our guests to their seats and helping with our donation tables. After 21 years at Twality Middle School, Dan Strauss is hanging up his baton. 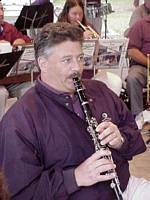 Dan has been a true friend to TVCB through the use of his band room over the years. Many young TVCB members were the product of Dan's expert instruction. We will all miss him and we wish Dan and Kathy the best in retirement. 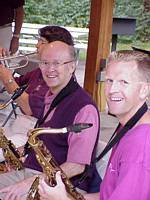 Click here to see pictures of his May 1, 2003 outdoor concert. Adult Band Festival Pictures Are Posted! On March 8, 2003, TVCB joined 12 other Adult Bands in Dallas, Oregon for a full day of music. TVCB performed A Copland Portrait, Aaron Copland, Adapted by Clare Grundman; Gemini, Star Suite for Band, Ken Dye; Symphonic Paraphrase, Elliot Del Borgo. TVCB would like to thank the Salem Concert Band and Dallas High School for hosting this wonderful festival! TVCB was pleased to play for the Oregon Zoolights this year. TVCB was pleased to play the following selections: Amazing Grace, Westminster Carol, Yuletide Celebration, Patapan, Santa Meets Sousa, A Winters Carol, Christmas in Europe, Silent Night, A Vaughn Williams Christmas, and Sleigh Ride. The audience joined the band to sing additional holiday favorites. The Band extends its graditude to all who attended and contributed to the Doug Saxton Memorial Scholarship in memory of clarinetist Kara Zander. Sunday, November 10, 2002, Tualatin High School (Pictures) TVCB performed another free public concert consisting of nine pieces, consisting of old standards and some new, exciting material (to see program, click here). The audience left humming passages from The Irish Washerwoman and Toccatarantella. Don't miss our Holiday Concert on December 15th at Tigard High School and then Zoo Lights on December 17th! Wednesday, September 11, 2002, Cook Park (Pictures) TVCB was honored to perform music that recognized the victims of 9/11/2001 and all the heros who work to make this country free. 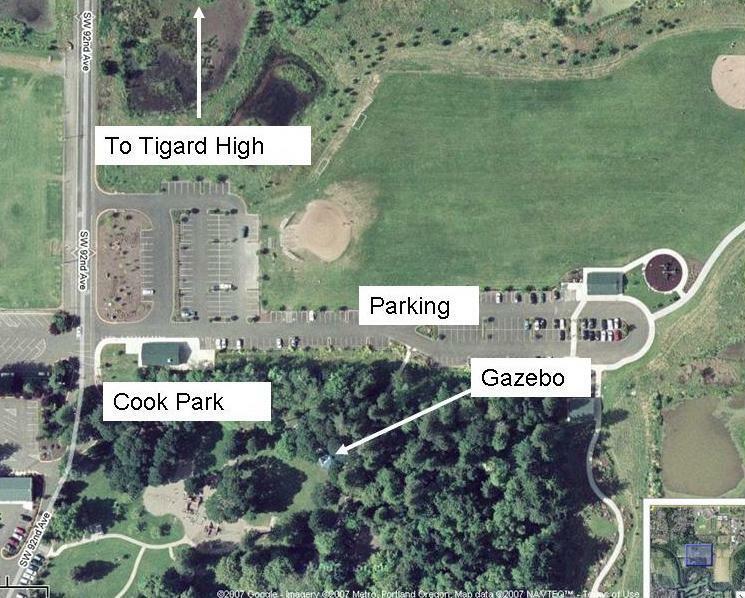 Sunday, July 28th at 3 PM in Tigard's Cook Park (Pictures). This family-oriented concert consisted of a wide variety of classical and popular music. We treated the audience with several musicians performing in small groups, woodwinds, brass and together! Scheduled works include - Sedona, Reineke; Georgia On My Mind, Carmichael; Riders for the Flag, Sousa; Second Suite In F, Holst; Themes Like Old Times, Barker; Concerto for One or Two Trumpets, Manfredini; Gaelic Rhapsody, Del Borgo; God Bless America, Berlin; Stars and Stripes Forever, Sousa. Tigard Volunteer Recognition, July 18, 2002. Pictures are posted! TVCB was proud to perform a wide variety of music to honor those who volunteer thousands of hours for the City of Tigard. "Tigard Old Fashioned Fourth of July Celebration," July 4, 2002. Pictures are posted! TVCB was proud to perform a wide variety of patriotic music for this community event. The weather was cool, but the rain stayed away. The fireworks are better every year! Thanks to everybody who attended this event that honored our veterans and those currently serving in the armed forces. Smith Aviation Concert, June 2, 2002. Pictures are posted! TVCB was honored to perform for the second year in a row at the Smith Aviation Museum. The concert consisted of patiotic songs and classic American pieces. We thank all who attended our performance. Oregon Zoo Lights - 12/4/01 - Just Click Here! Patriotic Concert - 11/13/01 - Click Here! TVCB was proud to perform for the public on November 13th and honored to participate with the Tigard Chapter of the American Legion as we recgonize all veterans. We thank the City of Tigard for the invitation to play. TVCB performed a wide variety of music to salute our Independence Day! Selections performed included; American Patrol - Meacham, Songs of the West - Holst, Bright Lights on Broadway - arr. Higgins, Victory Spirit March - Barker, American Finale - arr. Custer, Stars and Stripes Forever - Sousa. TVCB was honored to perform a wide variety of music to salute the members of the United States Armed Forces. Selections performed included; American Patrol - Meacham, Songs of the West - Holst, Bright Lights on Broadway - arr. Higgins, Victory at Sea - Rogers, transcribed by Bennett, Victory Spirit March - Barker, American Finale - arr. Custer, Stars and Stripes Forever - Sousa. A number of music fans gave up a warm, February Sunday afternoon to listen to soloists and TVCB. They were rewarded with excellent music and a great time. Director Steven Heuser conducted TVCB in Into the Raging River, Sky Valley Festival, The Children's March, With Quiet Courage, Bugler's Holiday featuring Dave Nelson, Phil DeLuca and Joe Marcinkiewicz, and Tis A Gift (Conducted by Joe Marcinkiewicz). Thanks for coming and see you at our next event! A Night in Mexico, Paul Creston; Fantasia 2000, Arr. Jay Bocook; West Side Story, Leonard Bernstein; Amparito Roca, Jaime Texidor; Brass on Broadway, Arr. Luther Henderson; The Midnight Fire Alarm!, Harry Lincoln; Into The Raging River, Steven Reineke; Molly on the Shore, Percy Aldridge Grainger. "Tualatin Valley Community Band Spring Invitational Band Festival,"
Many thanks to our friends from Marion County Band for performing with TVCB, our Directors, Cathy and Tim Roberts for handling the food, Jim Fitzpatrick for timpani transport, the City of Tigard, and all who made this such a success! "Tigard 4th of July Fireworks Festival"
The February 20th concert at Tualatin High School Auditorium was a real audio treat for the community! Featured High School Talent included: David Southorn, Violin; Alex Lewis, Oboe; Becky Mason, Trumpet; Sarah Springer & David Shelley, Oboe Duet; Jeremy Zander, Flute; Jon Titterrington, Piano; Alisha Piete & Julie Titerrington, Flute Duet; Julie Titterington, Flute; Shane Kelly & Kyle Leland, Trombone Duet and all the accompanists who should be proud of their recitals. Click here to view a few informal pictures taken before the concert. TVCB performed the following selections: Prairie Dances, Holsinger; Shenandoah, Ticheli; Empire Strikes Back, Williams; Irish Washerwoman, Anderson; Interlochen Variations, Jones; Instant Concert, Walters. Deb Fennell Auditorium, Tigard High School, 9000 SW Durham Road, Tigard, OR, Click here to view pictures! Tigard Daze Parade - 1999 Click here to see pictures! Oregon Adult Band Festival, Saturday, April 24th. David Douglas High School. Click here to see pictures! Sherwood High School Band Concert, Tuesday, April 20th .Click here to see pictures! Oregon Zoo Lights Pictu res!